I had a dream last night that the boys were flying small airplanes. (Must have been because we watched Gamera!) I think they dropped fruit from their airplanes, or maybe fruit-flavored candy (it is Halloween, after all!) And in the cockpit of each was a flashing light which said, “CONFORM.” I think my understanding in the dream was that this meant that the planes conformed to safety standards–always a good thing. Of course it read as a message to my boys as well, those glowing yellow lights. CONFORM! David was saying just the other day that Malcolm must be trying to figure out if he’s normal, and just what normal is. He’s at that age. His teachers say “Malcolm’s like this,” and his friends say “Malcolm’s like that,” and surely Malcolm must know best of all what Malcolm is like, but it’s not always that simple, is it? And how do you say, “Yes, you’re perfectly normal, you’re just like everybody else?” And at the same time say, “Normal is not all that it’s talked up to be.” I have watched him with his friends and classmates, and he’s an eleven-year-old boy like any other. They’re all loopy. You want them to be just like everybody else in the ways that make life easy, but good grief do I love all the ways that they are just like themselves and nobody else in the world. For Halloween they’re a wizard motorcycle captain and a devil boat captain. When they walk up to a door and somebody says, “And what are you, son?” They don’t say, “A pirate!” and run off the porch. They need to pull up a chair and say, “Well, it all started many years ago. You see, I was a normal boat captain once…” They’re characters! They have a story! They have a history. And normal children might worry about their house being burgled, but for Isaac it’s not impossible that a burglar will come to our house wearing squirrel-smelling perfume, and all the humans in the house will think, “Oh it’s just a squirrel in our bedroom,” (because that happens all the time) but Clio will say, “Wait a minute…” I cleaned up their room yesterday and I unearthed such a treasure of funny stories they started, and creatures they invented, perfectly normal games they combined to make way better games, odd contraptions they’ve devised of broken toys and electrical tape. They’re geniuses, I tell you! Mad geniuses! So maybe being normal means just pretending to be like everyone else, but if everybody is pretending to be like everybody else, and everybody is actually a little crazy, where does that leave us? I told Malcolm that maybe getting by in school, in this day of standardized tests, means just trying to figure out the rules, like it’s a game. And he said, “That’s easy, it’s just one button to press, over and over.” I suppose like all things it’s a balance. And we’re all in it together, we’re all holding up this fragile thing we’ve created, this semblance of sanity and normalcy, made from fragile wires and papers, but buoyed by the fire of our creativity and imagination. You need to learn to walk the line, but if you spend too much time in the middle of the road, you’ll get run over. I love molasses. It’s such an odd, old-fashioned flavor. It tastes like autumn to me. I decided to combine it with very dark cocoa powder and sweet spices to make a cake. And of course I added chocolate chips because everything is better with chocolate chips. Yes, Malcolm told me last week that I make to many cakes, but he wasn’t complaining about this one, because he loves it. He says it’s like spicy brownies. Preheat the oven to 350 and lightly grease and flour a cake pan. In a large bowl, cream the butter till fluffy. Beat in the molasses, sugar, vanilla, and then the eggs, one at a time. Add all of the dry ingredients and beat thoroughly, and then stir in the chocolate chips. Pour the batter into the prepared pan, and cook for 25 to 30 minutes, until it bounces back when you press it lightly and it’s pulling away from the pan. Turn off the oven and scatter the 1/4 cup of chocolate chips over the top. Put the cake back in the oven for a minute or tow, and when the chips melt, spread them with a flat knife. 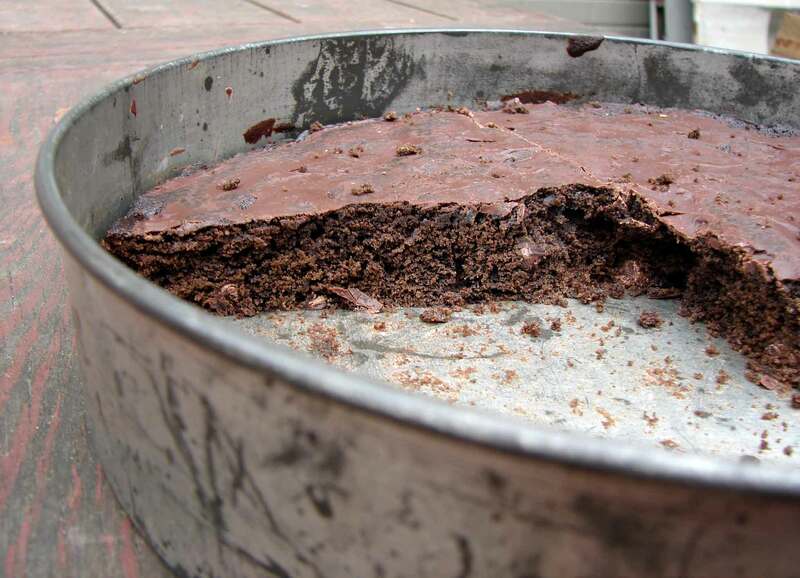 This entry was posted in cake, chocolate, dessert, recipe and tagged chocolate and molasses cake, chocolate spice cake, molasses chocolate chip cake, spicy brownies by Claire. Bookmark the permalink. Love the song and molasses!